Heartworm disease affects many animals all over the US and around the world. In fact, every state has documented cases of heartworm disease. While it is more typical for dogs to be diagnosed with the disease, it still affects other animals like cats, horses, ferrets and other mammals. So what is it? Heartworm disease is a potentially fatal illness caused by an infestation of parasitic worms (Dirofilaria immitis) in the heart, lungs or blood vessels. These worms, typically spread by mosquito bites, can actually cause heart failure, lung disease and organ damage in adult and baby animals. In honor of National Heartworm Awareness Month, we would like to highlight how to recognize this disease, treatment options and effective medicines in hopes of saving more animal lives. But how do you know when an animal has heartworms? In cats and dogs, the symptoms are usually very subtle and sparsely show in the early stages of the disease. However, as the disease progresses, you may notice serious clinical signs. While these are the most common signs of heartworm disease, there are more serious symptoms such as sudden collapse, difficulty walking and seizures. Unfortunately, some animals may not show signs until the disease has progressed to the fatal stage. Death and severe illness can be prevented with persistent, regimented treatment and early detection. The best way to detect if an animal has heartworm is to perform an antigen test. This test, administered by trained veterinarians, is designed to detect the antigens produced by the heartworms and released into the bloodstream. For cats, detection is a bit tricky. Cats will typically have to undergo various tests, such as X-rays, ultrasounds and blood tests. Young puppies should start heartworm treatment as soon as possible, as they are most susceptible to the disease. For adolescent and adult dogs or cats, it’s best to get tested by a veterinarian. Heartworm treatment varies from animal to animal. For instance, there is no approved drug treatment for heartworms in cats. However, the disease can usually be treated in all animals with the help of a veterinarian. Most treatments involve several steps. For dogs, one of the most effective treatments is adulticide injections. Once an animal is cured and the worms have been eliminated, it is important to implement a plan to prevent heartworms from developing again. This can be as simple as periodically administering heartworm prevention medication like Heartgard and getting annual check-ups. Heartworm disease is a serious illness that can cause severe discomfort, dysfunction and even death in animals. It is important to know the signs and keep your animals healthy! Make sure to consult your veterinarian if your animal is exhibiting any of the symptoms above and always remember to use preventative measures to thwart this horrible disease. Heartworm disease is a serious illness that affects many dogs throughout the United States and all over the world. These internal parasitic worms infect the heart, lungs and bloodstream, which can cause serious health problems and even death. Dogs suffering from heartworm disease could have 30 or more worms in their bodies. While there are treatment options for heartworms, there is no simple cure. Instead, owners and veterinarians must work together to create rigorous, multi-step treatment regimens and prevention plans. As part of National Heartworm Awareness Month, Medi-Vet is taking the time to highlight products that help to prevent this disease. One of the best ways to prevent heartworm disease is by administering preventative medication. Heartgard Plus Chewables for Dogs is a monthly oral heartworm tablet designed to eliminate heartworm larvae, Dirofilaria immitis, for 30 days after infection. These easy-to-administer tablets can be given to adult dogs as well as puppies at least six weeks old. In addition to eradicating heartworm larvae, Heartgard Plus also controls ascarids and hookworms and keeps them from growing inside the dog. However, Heartgard Plus does not kill adult heartworms. It is important to note that this medication is best suited for young dogs or dogs with an early diagnosis. Dogs love the taste of Heartgard Plus Chewables! These tablets can be administered on their own like a treat or mixed in with food. Once taken, Heartgard Plus starts to defend against the growth of worms and prevents the progression of the disease. 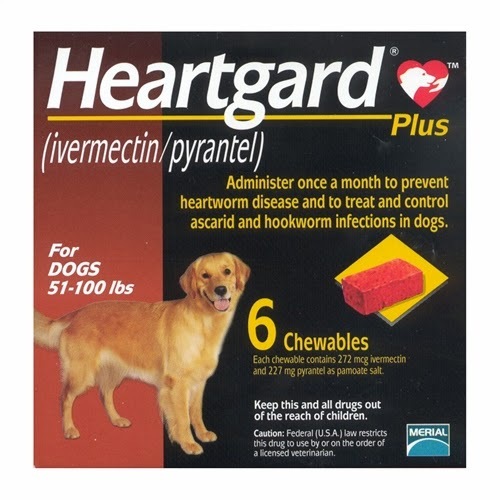 While adult heartworms are very difficult to eliminate, Heartgard takes care of the initial tissue stage and kills the larvae, so owners and veterinarians don’t have to worry! By treating your dog with Heartgard Plus, you’re sure to prevent heartworms and keep dogs feeling healthy every day. Not only is Heartgard one of the most effective treatments on the market, but it is the easiest way to implement a heartworm prevention plan at home. Medi-Vet supplies a variety of Heartgard Plus products in different doses for dogs of all sizes. Browse our website to find the medication that best fits your animal’s needs! Some dogs that have previously been spayed may display a loss of bladder control, or urinary incontinence. Unfortunately, this condition is more prevalent in dogs exhibiting signs of obesity, infection, anatomical abnormalities, or old age. Not only does urinary incontinence have the potential to cause problems for the dog, but it is a huge inconvenience for the owner. However, there are ways of treating this condition. 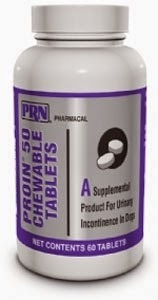 Proin 50 Chewable Tablets (phenylpropanolamine HCl) can be used to treat the long-term effects of urinary incontinence in female dogs. After being spayed, some dogs experience urethral sphincter incompetence, meaning the bladder is unable to hold urine. Owners are able to tell if their dog has a bladder problem by occasionally checking her bedding for wet spots. This is usually an indication that the dog is unable to control her urine during sleep. Proin tablets help by tightening the urethral sphincter, allowing the bladder to hold urine more effectively. Urinary incontinence can also cause other problems, such as dermatitis and irritation in the genital area. By assisting in tightening the urethral sphincter, Proin also remedies skin problems and odors associated with leakage. Many dogs suffer from rashes and raw skin due to the excess urine. This can make dogs extremely irritable and uncomfortable. The phenylpropanolamine in Proin acts as an adrenergic agent, which strengthens the muscles in the sphincter and causes dogs to experience more energy. Though Proin may cause enhanced excitability, it is able to help dogs control their urination patterns and feel better more quickly. Owners are able to rest easy knowing that their pet is not leaking during the day or sleeping in urine. The tablets are chewable and liver-flavored, which makes it easier to feed it to your dog. Dogs love the taste of Proin, and owners can administer the tablets with food, or use them as treats. Once the dog begins taking Proin as directed by the veterinarian, the medicine works fairly quickly. It should only take a few days for your dog to start seeing results. Owners and their dogs can live happier and healthier after taking Proin. This little pill can do a world of wonder! Visiting a veterinarian is probably the most obvious option when your animal is sick, but some owners prefer to treat their pets at home for minor aches and pains. Homeopathic and holistic approaches to pet care can be extremely beneficial to both the animal and the human. What is Homeopathic Medicine and How is it Used on Pets? Homeopathic pet remedies are best when used to treat simple wounds and illnesses instead of using drugs. 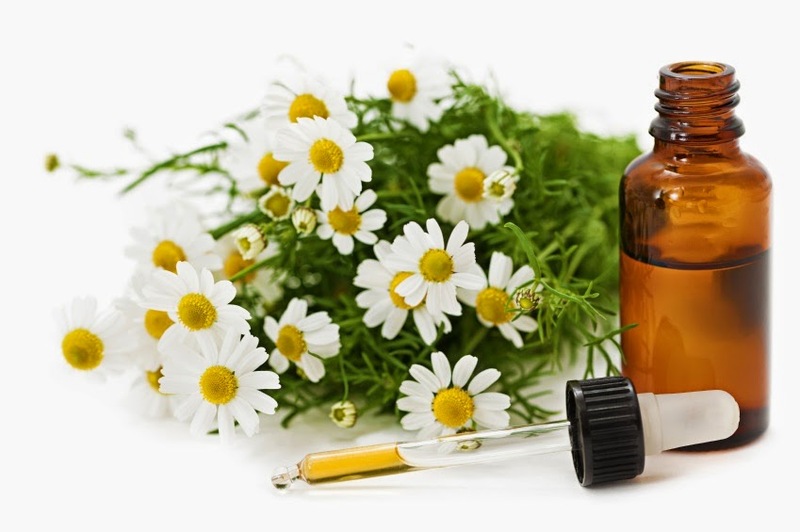 Homeopathy is a type of alternative healing that recommends using small doses of natural substances, such as herbs and minerals, to remedy illness. It was founded on the principle that animals and humans both have a self-healing response. When an animal exhibits symptoms of an illness, the homeopathic solution would be to create a remedy with natural substances that are said to actually cause those same symptoms. For instance, if a dog has a runny nose, a remedy concocted from refined onions can help to minimize eye tearing and other cold symptoms. Because onions typically cause eyes to water and noses to run, they are the perfect cure for animals with a cold or runny nose. The animal’s healing instincts recognize what is happening inside the body and reacts, curing the condition naturally. Going the all-natural route definitely has its benefits when it comes to pet care. So what are they? Below are the top five benefits of homeopathic pet care and medicine. 1. Homeopathic medicine tends to have less side effects than prescription drugs and steroids because it’s made from completely natural substances. 2. Because homeopathy promotes self-healing, it also has the potential to strengthen your pet’s immune system. 3. Using natural substances minimizes your pet’s exposure to harmful toxins found in chemical-based products. 4. Remedies can be made right at home from household ingredients like herbs, spices, and minerals, which helps to reduce costs. 5. Your animal can remain comfortable at home, surrounded by people it trusts. Visiting the vet can be a traumatic and stressful experience for many pets. By treating an illness at home, you can ensure that your pet remains at ease. Please browse our wide variety of homeopathic remedies for your pet today! While homeopathy can be a great alternative to traditional veterinary medicine, it should only be used to treat minor illnesses. It is important to note that if your animal is experiencing severe symptoms, it is best to seek help from a vet. Many dog owners work outside of the home eight or more hours a day, leaving their beloved pooch alone to entertain itself. How long you can leave a dog alone depends much on the temperament of the particular pet, but there are several ways you can reduce separation anxiety and its related negative behaviors. A bored and lonely dog can cause a lot of trouble in a short amount of time. 1) The number one way of keeping your dog happy when it is alone all day or night is to give it something to do that occupies the bulk of its time. Sleep fills time with 0% chance of causing mischief. Wake up a bit earlier before work and take your dog on a long walk or a jog to tire them out. It is healthy for both of you and will leave your dog to pass some of his alone time napping comfortably instead of anxiously waiting for you to return. 2) Providing dog toys to keep them busy is a great option to avoid your curious pet making a toy of your belongings and home decor. Be sure every toy you give them is perfectly safe before you leave the house. Rawhide bones should not be given, as they can become frayed and cause choking. A wide range of kibble-dispensing toys are on the market to keep your pet busy for hours. Only include a regular meal's worth of dry food and not extra treats that may lead to dangerous weight gain. 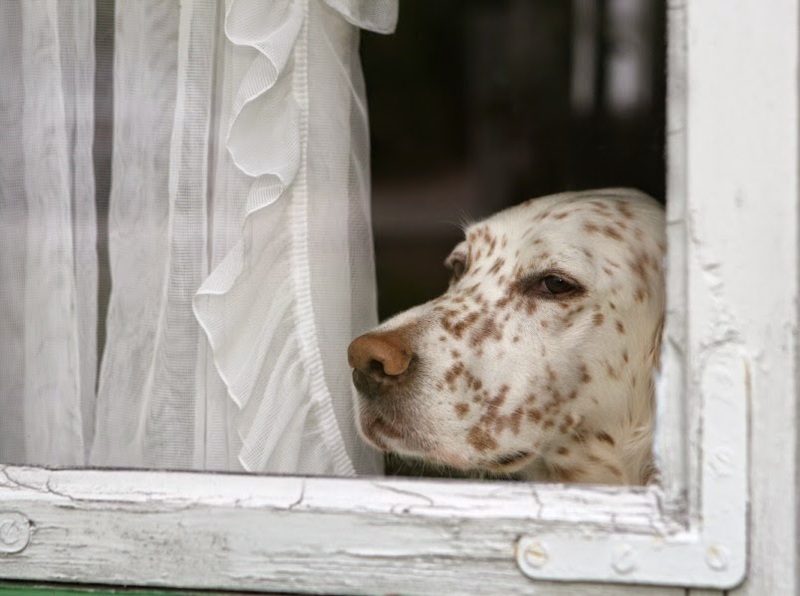 3) For dogs with separation anxiety, natural anxiety relief remedies may provide more help. The tasty treats include nutrients and herbs, such as L-tryptophan, chamomile and vitamins, that promote calm and quiet relaxation. Your pet will love the taste and be able to relax while he awaits your return, rather than becoming anxious. We offer a wide range of calming aids and toys to help your dog enjoy his time alone and help you feel peace of mind that your beloved pet will be content until you can be together again. Veterinarians require a vast array of medication syringes to use with hypodermic needles and catheters for feeding tubes. Both varieties are designed for single use and come individually packaged and completely sterile to maintain maximum health and necessary safety in the veterinary clinic. Monoject syringe varieties are available for any application and come in multiple volumes, from 1 to 60cc. Both regular Luer, on which the needle can slip off easily for disposal, and Luer lock, with affixed needles that will not detach when administering heavy medications, are available. The larger syringes usually have catheter tips that are designed to be used with feeding tubes when medication needs to be administered directly by mouth. These have accurate volume markings on the barrels and come in sterile packaging. Veterinarians also use them frequently for giving thick liquid food to animal patients. All syringes are latex-free to prevent allergic reactions and have tight-fit plunger rods. Needles, which are also offered separately, maintain the highest level of sharpness to make injections less painful for the cats and dogs. The more common use of these products in the veterinary clinic is for treating pets with diabetic conditions. Monoject offers pre-filled pet insulin syringes in both 1/2 milliliter and 1 milliliter volumes, so veterinarians can quickly choose the correct dosage for the pet's specific blood sugar needs. Their easy-to-open sterile packaging makes them convenient in the hospital. Diabetic syringes for dogs and cats should be clearly marked with the volume calibration for precise administration of insulin based on blood chemistry needs. The syringes offered here are manufactured with Accu-Scale precision technology, so there is never a mistake or waste of medication. The volume of insulin is easily viewed through the clear barrel. This same quick view calibration is offered on syringe barrels for other uses besides diabetes as well. One of the most frequently used tools in a veterinary hospital or clinic is the syringe. Whether an ailing cat needs to be fed by mouth or a diabetic dog needs insulin injections, Monject and other brands fulfill the needs with syringes and needles that are top-quality and easy to use. Do you have a rambunctious pup who eats too fast or a curious dog who could use some extra mental stimulation? Then our product spotlight this month will be right up your alley. We’re proud to feature the BUSTER DogMaze food dish, an innovative dog dish that will help keep your dog healthy by regulating what they eat while staving off boredom. This unique dog food dish is designed so that dog food can be poured into a maze-like series of troughs, which means your dog eats by pushing his food toward one of the exits. Similar to puzzle toys like the Kong and other mentally stimulating toys and games for dog, the DogMaze was carefully crafted to gently challenge your pooch while keeping him happy and satisfied by ultimately allowing him a reward; in this case, food. Because of the extra work involved in eating the dog food, this dish makes an especially wonderful staple for dogs who always seem to eat too fast. The process of “achieving” the food will naturally slow them down without frustrating them. Eating too quickly can lead to indigestion, poor hunger regulation, and a series of other problems; just like with people, the key to regulating dog weight naturally and prevent digestive issues is to encourage slow, mindful eating! Once your dog is done with his meal, he’s much more likely to be happily tired and satiated than he would be after putting away his entire dish of food in 30 seconds. Because of the smaller portions the DogMaze encourages, we’d recommend switching, if you haven’t already, to a high-quality dog food that offers less filler and more nutrients per ounce. Look for food that doesn’t list “corn” or “wheat” as one of its first ingredients; as a rule of thumb, a hearty protein like chicken, beef, or salmon should always be the #1 ingredient in your dog food. Foods that don’t contain too much grain or other superfluous ingredients will fill up your dog more quickly while allowing you to dole our smaller portions. In fact, most pet owners discover upon switching to high-quality dog food that they’re actually spending the exact same amount of money on food that they used to; the smaller portion sizes means a single bag of dog food stretches for a longer period of time! We also love using the DogMaze as a treat-dispensing system. Help a bored pup stay busy by putting a few treats, like some Purina Light Snackers, into the bowl and then let your dog go to town. Having them work out little tasks like this is one of the best ways to keep dogs mentally stimulated. The bowl can also be highly effective in the battle against separation anxiety; put some of your dog’s favorite treats in the dish as you’re heading out the door, and he’ll be so busy trying to get to his treats, he’ll barely even notice that you left. Here’s a quick tip: the bigger the treat is in size, the more difficult the maze will be. This one-size, dishwasher-safe product will work for any dog breeds. It works great both indoors and outdoors, but we’d personally recommend keeping it indoors; the product’s unique design means it’s quite a statement piece. Best and most importantly of all, dogs love it. But don’t take our word for it; watch this cute video of an adorable terrier named Chilli playing with her new favorite dog dish! We’re well into 2015 and it’s time to fess up: how have you been doing with your New Year’s resolutions? If you’re like many of us, you probably began the year with the best of intentions, but may have started sliding a little; new habits are incredibly difficult to form. But it’s not too late to get back on track – or stay on track, for those lucky disciplined few. We have a secret for you that you’re going to love: your dog is your ticket to a better, healthier you in so many ways! Read on to learn how you can incorporate your dog into your new routines for an instant accountability partner who will love you no matter what. One crucial word of advice: just like people, dogs need time to ramp up. So, if your dog is used to being relatively inactive, make sure you prevent injuries and fatigue by easing them into their routine gradually. Start with a couple days per week of walking or very short runs and work up from there. When in doubt, ask your vet; they may recommend some joint medication or extra vitamins and supplements for your dog’s new activity level. Working up gradually will actually help you stick to your own routine more in the long-run, too; going from 0 to 60 too quickly is a major reason many New Year’s resolutions fail. How Your Dog Can Help: What could be a more perfect gateway to a host of fabulous, free reactional opportunites than your dog? Your favorite four-legged friend can now be your favorite excuse to go to the park or dog park, plan a hike, or even take that road trip to the beach you’ve been dreaming about. We all feel a little guilty sometimes, as we get busy, about the idea of taking time for ourselves. Doing something that makes your dog happy too can reduce this guilt – which you shouldn’t feel anyway; you deserve to enjoy yourself! How Your Dog Can Help: We hate to be the bearer of bad news, but if you let your dog sleep on your bed with you, the odds are extremely high that you’re not getting a good nights’ sleep. Pets can be extremely disruptive to our sleep cycle, not just because they move around quite a bit during the night, but also because the space they take up can sometimes put us in uncomfortable sleeping positions. So as lovely as it is to sleep with your dog, giving them their own dog bed or crate will keep both of you happier and healthier. Most dog experts agree that this practice is, in fact, the best thing for your dog too, as it reduces confusion about who the “Alpha” in the home is. Buy a dog bed or crate and some snuggly blankets or toys, plying your dog with treats as necessary to get him used to his new abode. Hold strong on this one; it really is good for both of you. How Your Dog Can Help: Your dog may be your best friend, but he’s also the perfect way to meet your new human best friends. Dog-centric Meetups exist in almost every town; in fact, if you’re a breed fanatic, there are even Meetups for owners of specific breeds like Corgis, Labradoodles, Border Collies, and more! It’s easy and cheap to start a Meetup of your own if you don’t find something that speaks (or “barks”) to you. Not into the idea of a formal Meetup? Most major cities also happen to cater to dog-lovers by being home to coffee shops, restaurants, and even bars that allow dogs. Simply search for “dog-friendly ______” in your area and we bet you’ll find something. We even know of a bar that hosts regular “Yappy Hours” with drink specials for dog lovers and their pets. As many dog owners can tell you, even just walking down the street with your cute pup can be a great way to make some new friends. So don’t let yourself down this year! Your dog is here to make you the best human you can be. But if you slip up, they’ll still greet you at the door with plenty of kisses. Happy New Year from Medi-Vet!